(Ver 1.3) This is a difficult question to answer and a much more difficult subject to understand than many people give it credit to be. I had a reader ask me a question about why Catholics receive the Eucharist at every Mass? He said that the Eucharist is given out every day in thousands of languages. Do we have any scriptural basis for this and why would we do it so often? This is Part 1 of a series of lessons on the subject of the “Eucharist”. We will discuss; what it is, why we do it and how it applies to the modern church from a Bible perspective. I will explore many different aspects of this subject and give you quite a few new perspectives on this subject. I challenge you to read the entire series before you become a critic of any small part of the lessons. I will definitely warn you up front what I teach you will be different than what you might expect me to say on the subject, but yet I will only use the Bible to explore this subject and I will do my best to keep my opinions completely out of the discussion. What I am interested in is what God thinks about the subject and not what you or I think about it. I find that God’s opinion is much more important to me than your opinion. In asking Catholics why they participate in receiving the Eucharist, I found that a vast number of answers to that question was “I don’t know”. Not one could give me a Bible verse or a Bible reason for receiving the elements of the Eucharist. Some knew that the bread and the wine represent the Body and the Blood of Christ. But why we receive it and participate in the ceremony, they could not tell me. Is there any benefit to participating in this ceremony? Is there a blessing attached to it? Or do we do it just because it is the right thing that we should do? What makes it the right thing to do? This might become a widely controversial subject before I’m through, so if you are interested in learning the truth keep reading, otherwise you might want to stop here and go to another website or blog. 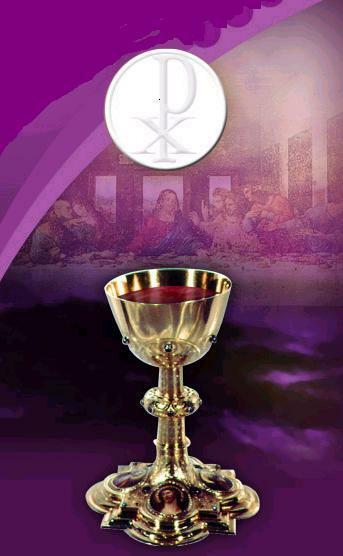 So now I will begin to teach you some of the things that I know from the Bible about this subject of the “Eucharist”. There is absolutely no way I could tell you everything I know about this without writing a small book, so I will not be doing that. So today is just the introduction to the subject and like I said, it will probably be totally different than what you might expect. The Bible says that God is a Spirit (John 4:24). God existed throughout all of eternity, outside of the dimensions of time and space limitations that we exist within right now. The Bible says that God created the heavens and the earth (Gen 1:1). So God existed prior to the existence of this physical universe. We therefore know that the physical universe had a specific point of origin. When God created man in this world, God breathed the breath of life into him and this was Adam’s spirit which came from God’s Spirit (Gen 2:7). Hebrews 12:9 says that God is the Father of all spiritual beings. Therefore, man is technically a spiritual being that lives within a physical natural body (1 Th 5:23). Why is all of this important? Sometimes I just need to state the Bible basics before I try to introduce you to more advanced spiritual subjects found in the Bible and I do this to help refresh your memory. If you disagreed with anything that I have said so far, you will have greater difficulty with the remaining things to come. Let’s take a look at a verse that is not directly about the Eucharist but yet applies indirectly by the stated application. The Bible says that we need to focus our attention away from the natural physical things that we can perceive with our senses in the world and instead focus on the things that we cannot see. This is a contrasting verse that is comparing the natural dimension to the spiritual dimension. The Bible tells us clearly that those things that are natural and physical are just “temporal”. The English word temporal is translated from a Greek word (G4340) that means “temporary”. Anything that is considered temporary is not eternal. What God is saying is that this world is disposal and will change to the permanent some day in the future. Therefore, physical things can be viewed as being “here today and gone tomorrow” or “easy come and easier go”. What God is saying to us is that there exists nothing in this physical world that is visible that we can call “permanent”. Do you understand this? Only your unseen spirit which is present inside of your body right now will exist forever after your death and this existence will be either in heaven or in hell depending upon what you have done in this life to receive or reject the finished work of Christ Jesus. Of course God will create a New Heaven and a New Earth someday and these will exist forever and we who have received salvation will live there (Rev 21:1). Uh Oh? Jesus didn’t even mention the Eucharist, did He? As you should be able to clearly see He did talk about the Eucharist in an indirect reference. Jesus is talking about something going into your mouth as natural food. Unleaved bread and wine (grape juice) is normally used in the Eucharist church ceremony. What exactly is Bread and Wine? Here is another verse of scripture that is difficult to understand for many people. Jesus is speaking about the difference between natural things and spiritual things again. Jesus is saying that anything that you eat naturally and put into your mouth does not cause you to be “defiled”. To defile something is to cause it to be “unclean”, “polluted”, or to be “profane”. You can clearly see that Jesus is saying that it is not what you physically eat that causes you to sin and to become spiritually unclean. What would be the opposite truth (antithesis) to this statement that Jesus just made? I believe that it would be “There is nothing that you can physically eat that will make you “clean”, “pure” and “undefiled”. So what am I saying? I am saying that the “Eucharist” is a physical representation of something that is a spiritual truth that is more important than the physical pieces that you handle with your natural hands and put into your natural mouths. Jesus continues in this context to describe the things that you physically eat as being only natural things that are processed by the physical body and expelled down the toilet (Mat 15:17). So what makes the Eucharist elements any different? I think that is a very excellent question to consider. It would only be different if you knew what it all meant and how it all applied to your life as you partook of these elements. Without the knowledge and the reason for the action the action seems to be worthless to me based upon what Jesus just taught us about eating physical food. What we are seeing now in the Bible is a pattern of truths being revealed to us. There is a major difference between natural things and spiritual things. The natural things are placed here as temporary teaching tools and the spiritual things are the eternal things to be focused upon. Doing natural things without understanding the spiritual things behind them actually does you no good physically, emotionally or spiritually. I pray that you are grasping these important concepts. Jesus is clearly saying that these men worship God in vain, because they were teaching the “doctrines” and “commandments” of men. So when you do something that you do not have any reasons for why you are doing it, how do you know it is not a humanly created doctrine of man? Perhaps it could even be something that was designed by Satan to deceive you into a lie? Jesus said by adding your thoughts on top of the Word of God, you render the Word of God to be of No Effect! (Mat 15:6) These are all very strong words of warning to all those who practice religion and do not know God. Your religion will not save you. The partaking of the elements will not saved you. Going to church will not save you. Becoming a member of the church will not save you. Being baptized in water will not save you. I could go on and on but you get the point, I hope. Any Christian who can not give a scriptural reason for why they are participate in the “Eucharist”, do you now see why it might be important to find that information before the next time you blindly participate? Does it make a difference if you do something with our without knowledge? Is it just the fact that we did something that makes it right? Is the fact that someone blindly participates in something that causes them to be in God’s favor? I do not think that God would have written the Bible, if He wanted you to blindly parrot and monkey religious rites. What makes Christianity different than any religion in the world? It is the fact that we have a personal relationship with God and in other religions they are trying to just please a god that they do not personally know or understand. So I’ll ask you again, does blindly following a ritual cause you to derive any benefit from what you did? Not according to what Jesus just said in Matthew 23. Jesus told us these were just the action of religious hypocrites. Please do not be offended at what I just said. I am not naming names and I did not call anyone this by name. I’m just reading the Bible and people need to decide if the Bible applies to them or not. I’m not your judge, so I will not judge you or whatever you do. I think I will stop this introduction to the subject of Eucharist right here for now. I know I did not attempt to define the term or explain what it is or how it applies to us today. I think these will have to be future topics that we discuss as we continue to learn. Today I wanted to get you to think afresh and I wanted to shift your focus off of physical natural things and get you to start focusing on lasting spiritual things. Quit being a person who does something and does not know or understand why they are doing it. There is a major difference between natural and spiritual things and it is time for the Church to realize it. Are the temporary things in the world more important to you than the eternal spiritual things of God in you? If they are God and anything else that I tell you from the Bible can’t help you. Be blessed in the knowledge of Him that is Faithful and True. If you have any specific questions or comments please feel free to share them with me. If you have any experience with participating in religious rites without understanding the reasons why you are doing them, please share those also. Until next time, God Bless! If you would like to continue reading the next lesson in this series, you may go to “Part 2” now. Posted on August 8, 2010, in Bible Study, Eucharist, Understanding and tagged Bible, Christianity, Church, Eucharist, God, Holy Spirit, Interpretation, Jesus, Prophecy, Religion, Revelation, Salvation, understanding. Bookmark the permalink. 1 Comment. Well said, seek the spiritual treasures of heaven & not the things of this world.